The G-115 Classroom Series explores the visual phenomenon of a mundane room. 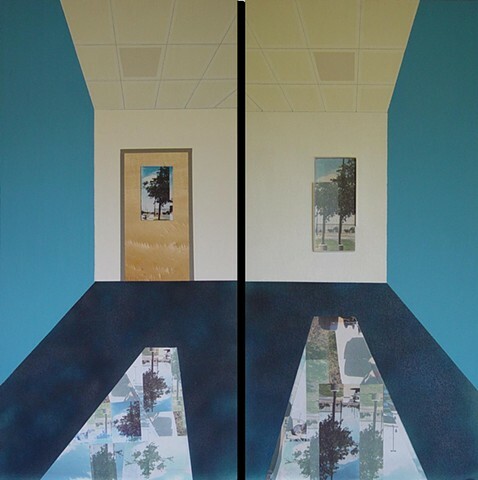 The G-115 pieces show the wooden classroom door and the view through its window, across the hallway, through the window in the G-119 classroom door, across that classroom, and out through its window to an abstract landscape or an art history view (Japonisme). 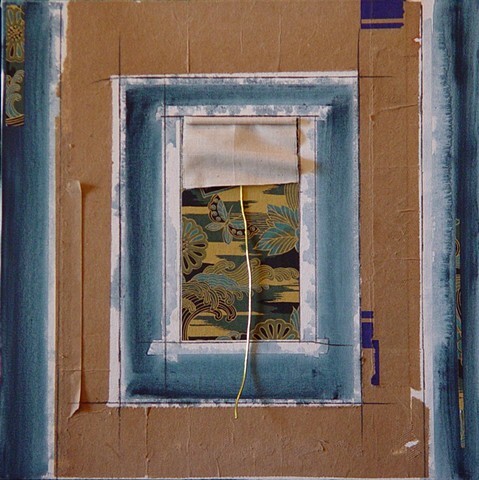 Mixed Media: acrylic, pencil, brown paper bag, Yuzen silkscreen printed paper, muslin, cord, wood dowel on canvas panel. 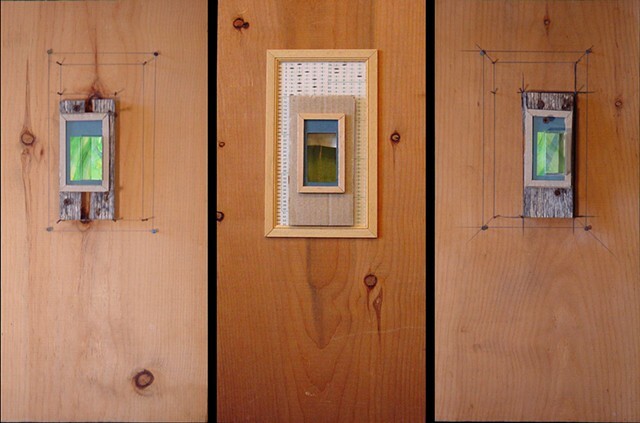 Mixed Media: found wood, found nails, found watercolor (Betsy’s), cardboard, Plexiglas, sandpaper, muslin, dowel, cord, pencil on pine board. Mixed Media: cardboard, mat board, found watercolor (Betsy’s), Plexiglas, acrylic box, graphite, charcoal, found nails, found screw, paneling nails, carpet tacks, found wood slat, Scantrons, coffee stirrers, papier-mâché, muslin, twine on pine board. 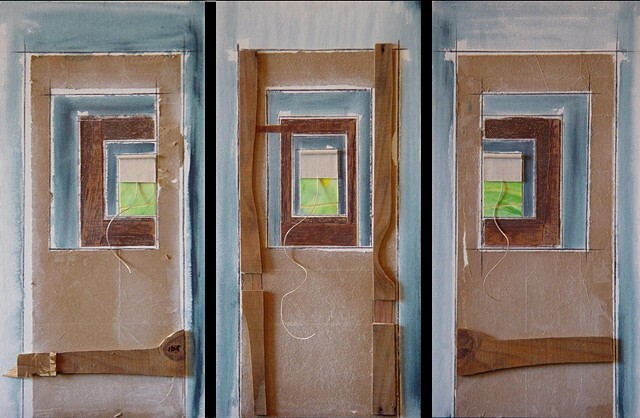 Mixed Media: cardboard, mat board, found watercolor (Betsy's), Plexiglas, acrylic box, graphite, charcoal, found nails, found screw, panelling nails, carpet tacks, found wood slat, Scantrons, coffee stirrers, papier-mache, muslin, twine on pine boards. 18 7/8 x 28 1/8 x 1 5/8"
Mixed Media: acrylic, brown paper bag, graphite, Yuzen silkscreen printed paper, mulberry paper with gold metallic inclusions, wood, muslin, cord, graphite, wood dowels, corrugated cardboard on canvas panels. Mixed Media: paper, cardboard, mat board, wood, graphite, acrylic, wood, found water color (Betsy’s), muslin, cat whiskers on canvas panels. 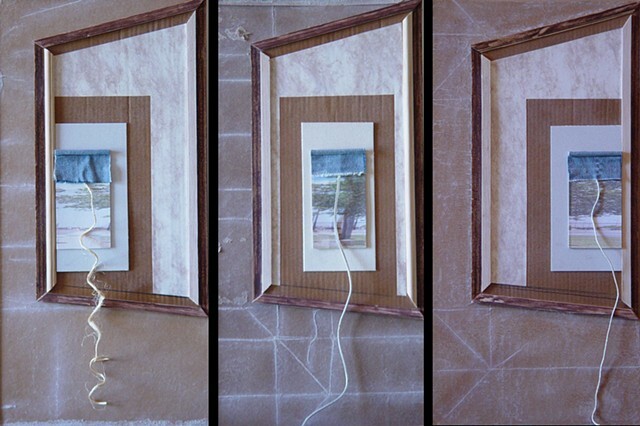 Mixed Media: paper, cardboard, mat board, wood, fabric (L’s jeans), graphite, pastel, digital photo, twine, suede, string on canvas panels.